I’m excited to show you my newest fun resource! This is a great activity for a literacy center, or a fun extra for early finishers. I’ve created a “Find the Difference” set (fall themed) that includes 10 colorful pages with similar pictures on them. Each set of pictures has 5 small differences for students to find and circle. I also have included 2 leveled response pages so you can include some writing practice with the activity! 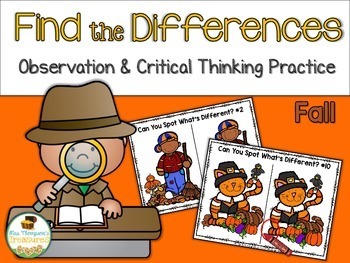 These are great activities to help your students practice observation and critical thinking skills as they compare the pictures on each page. If you’d like to check these out, you can visit my store HERE!